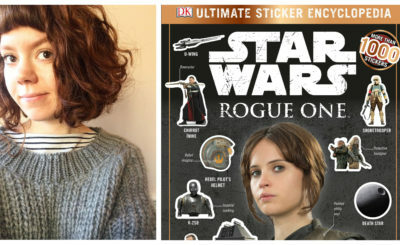 Katy Karwheel was a droid and creature performer in The Force Awakens, The Last Jedi, and Solo: A Star Wars Story. She answered a few questions via email for this interview. What was your introduction to Star Wars as an audience member? I was not into Star Wars as a child, but really liked the Ewoks and was shocked by the Luke and Leia story – family scandal!! Do you have a favorite Star Wars film or favorite characters? I totally love The Force Awakens and Rey is my favourite character .. followed closely by Kylo Ren. I like the way that Daisy speaks so ‘normally’ as Rey – it always strikes me. She is an authentic actress and I dig that. 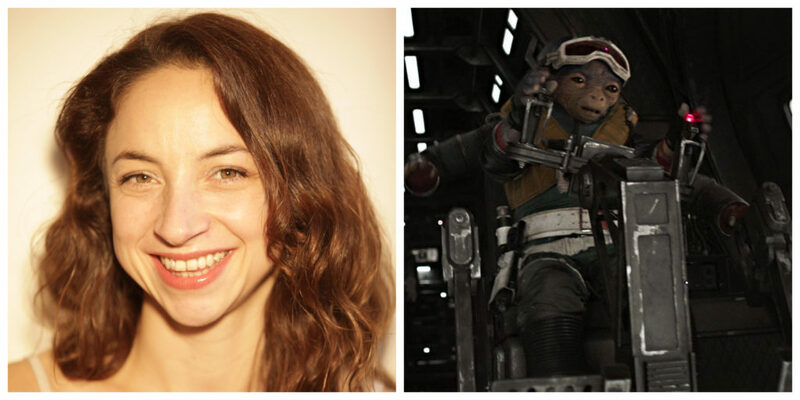 How did you become a circus performer and how did this career lead to work as a creature performer in Star Wars films? I ran away to the circus age 17 after becoming homeless in London. At school I was passionate about the arts and I had trained extensively as a gymnast. I got my first role in SW as a stilt-walking robot – directly through Aircraft Circus School where the artistic director – Alex Frith recommended me to a film friend who was searching for a short stilt-walker. 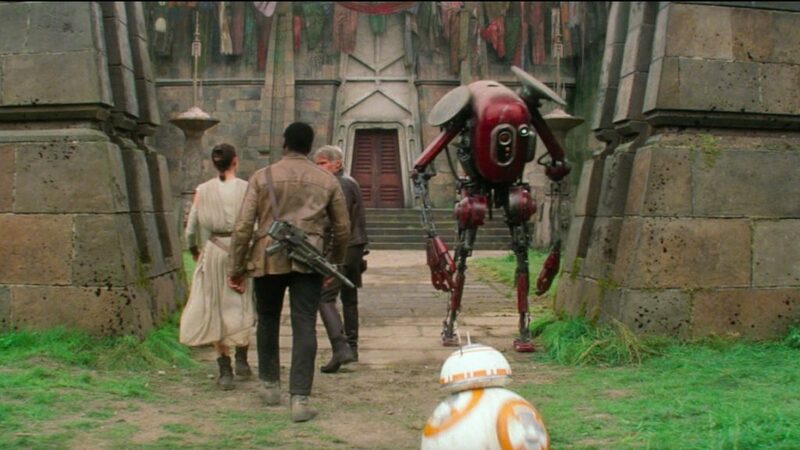 This role in stilts was the droid HURID-327 in The Force Awakens who appears outside Maz Kanata’s castle. I’m curious how long you had to prepare for this role and how much of a costume you had. We prepared for a few months. I started in Pinewood Studios practising various walks, runs, turns and characterizations on the stilts. Then I would go in for fittings, during which I had robot leggings made, trainers bought, back plate attached to a top. Then more and more weight got added to the stilts as the droid was added to, making it look more robot like. One day I arrived at the studios and the upper shell had been crafted, then the arms were added, and finally the whole thing was sprayed and painted giving it that rustic star wars look that we all know and love. It took a while to walk ‘Big Red’ confidently with the top heavy weight and the lack of vision. How long it did take to shoot your scenes as HURID-327 and did you have any idea what was going on script/story wise in those scenes while you were filming them? The actual shoot took 1.5 hours from start to finish – I had no idea on the top secret script – only people with lines saw the script and it was shredded at the end of each day. I knew I was walking past the main characters though and that was cool – I loved shooting that scene – it was a total buzz and the Big Red team smashed it! 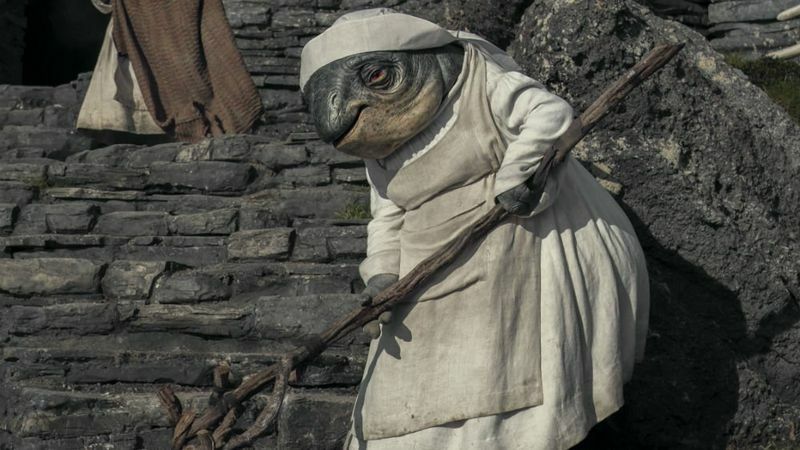 For The Last Jedi you played one of the Caretakers on Ahch-To. How was that experience different than your experience playing a droid in TFA? How long were you on set for TLJ and how many creature performers were there for the Caretakers? For a start I was walking on my own feet so I just felt really lucky. It meant that I knew that I had been blessed with an ‘easier’ creature so I totally embraced the process and didn’t waste one second not appreciating it. There were 30 caretakers at first – 10 were cut if the creatures department didn’t think they were up for the job. Then 20 of us did an amazing party scene dancing round a fire – a night shoot at pinewood. It was a shame this scene was cut from the movie. Rian Johnson thought it too distracting from the story – he was probably right. Four of us flew out to Ireland to shoot the scenes that made the movie – I was lucky enough to be one of them.. but I really wanted to go and made sure I was on the ball, positive, and working hard in all I did. Did you play more than one Caretaker? Is there an easy way for fans to spot you in that film? I am the caretaker with the rake – raking up the stones on the steps. There is also a funko pop out which has a rake! You had your biggest creature role in Solo: A Star Wars Story playing Rio Durant. Can you talk about how you prepared for this role and how you approached a role where you played part of Rio’s body while other parts of him were created with CGI? As a circus performer I have good aerial awareness and upper body and core strength. Rio needed to be able to swing around dynamically on the AT-HAULER. I spent months practicing on a scaffold frame in pinewood studios devising different routines and moves in which I envisaged Rio manouvering himself in the ship’s cabin. I also had to devise ways in which he would cook on the campfire. I had help from some of the puppeteers for this and Paul Casey helped me with Rio’s walk, turns and movements. I also had a session with a helicopter pilot who taught me how to fly realistically. Rio’s back arms are CGI’d – oh and the face – the rest of what you see is real, practical effects and I wore the costume throughout. Do you have a favorite part from that film? Were you surprised about anything seeing the completed Rio on the screen for the first time? I was surprised that pretty much all the scenes we shot made it into the movie. It was incredible seeing our work on the big screen. 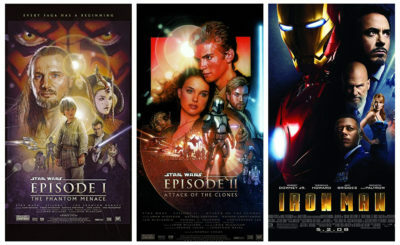 For the three Star Wars films you have appeared in can you share some highlights or challenges? Each character was a challenge. 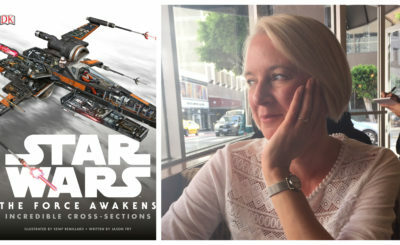 In The Force Awakens I was totally overwhelmed by the entire operation as I had never done a big movie – and I found it hard to rise up to the mental challenge of being confined without vision in an incredibly difficult to maneuver creature. On The Last Jedi I was just totally appreciative – but I did suffer some panic attacks whilst I had the caretakers head on, because I was boiling, and sometimes the puppeteer (Mark Jones) closed the mouth completely so I lost all vision and air (bet you loved that Mark!! 🙂 ). I didn’t tell anyone that I had the occasional claustrophobic moment – I just practiced meditation before and after shooting, and I focussed on ‘being’ a caretaker when the head was on which gave me a focus for my body and mind. Rio was just amazing, I spent so long in that costume doing shoot after shoot, I knew all the lines as I had to speak them and act them with my body during shots. I worked closely with the leads and it was lovely learning a lot from the Hollywood stars about how they prepare themselves pre-shot, to how they manage themselves during a shot, to how they navigate any ambiguous moments .. yeah it was a learning curve and I smashed it! How about any misperceptions people have about how creatures come to life in these stories? People tend not to realise the months of work that each creature has had to get it to screen. I know you’ll be at Star Wars Celebration Chicago. Where can fans find you there? Anything in particular you are looking forward to during this convention? I’m putting on a Circus Show in Marlow, Bucks, England in May – come watch!!! I’m going to be a blue leopard on an aerial rope!!! 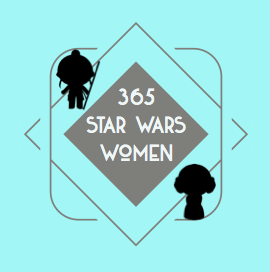 Check out all of the interviews from the 365 Days of Star Wars Women project here.